As a welder, you know there is a lot of science that goes into creating the welding equipment you depend on. If you are a hobbyist or student new to the trade and looking for welding gas in Georgia, you can read this blog to begin to learn how to choose between the welding gases available from Sidney Lee Welding Supply. Your choice of shielding gas to use along with your desired arc welding method, such as gas metal arc welding (GMAW) or gas tungsten arc welding (GTAW), will affect several aspects of your weld. These range from the aesthetic appearance you are able to achieve, to the quality of the actual weld, to the resulting content of metal alloy making up the final weld. One basic distinction between the variety of welding gases used for shielding is whether a particular gas is inert (also called noble) or in a compound. The noble gases come as monatomic, while the compounded varieties are diatomic: this means they are either present in the form of a single atom, or made of two bonded together. This seemingly little detail has major effects on the job when made part of your welding equipment. As a welder you will come across these either as pure gases (like argon gas), or in combinations of mixed welding gases. Each shielding gas, with its different chemical profile, burns differently, and so creates a different kind of weld suitable to various metals and projects. Single atom gases such as argon gas or helium have their special uses for GTAW applications on shiny metals (in the case of argon) or pure copper (helium). Pure carbon dioxide gas is applicable to certain GMAW uses though runs the risk of oxidizing when the elements separate during the burn. Combinations of diatomic welding gases like oxygen and hydrogen can generate high heat that suits their use for certain kinds of steel. Mostly welders will choose among the mixed form of the above kinds of gases. For welding carbon steel, argon gas and oxygen mixed with CO2 in precise percentages depending on the depth required in a weld. If you are hoping to weld with GMAW on stainless steel, then helium gas would be recommended for the right mix of welding gas. 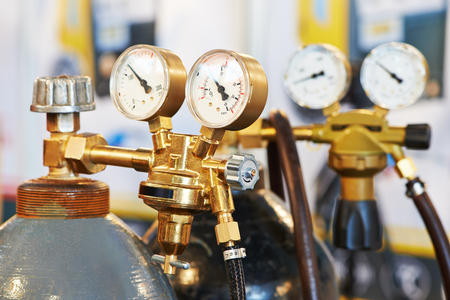 The expert welding gas professionals at Sidney Lee welding supply take pride in providing our customers with the perfect mix of high quality welding gases right for the job every time. Ask us about our selection of both bulk liquid gases and compressed gas cylinders for your welding work in the Hampton, Conyers, Macon, and Douglasville areas.